Recently, while working with a client, I got into an interesting discussion about doing web analysis around key dates in their marketing program. There are many cases in which milestone marketing events take place on specific dates and clients ask me if there is an easy way in SiteCatalyst to slice and dice data by those key dates. What web analyst hasn’t had a situation where metrics spike up or down on a date or date range and you have no idea why! This is a topic I have dabbled with over the years, but this situation forced me to think about it a bit more deeply. The following will share some ideas I had related to this in case this is a question your organization has as well. However, adding notes to reports doesn’t allow you to do much in terms of reporting data. 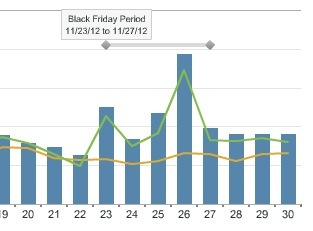 Let’s say that you wanted to see the Average Order Value (AOV) for your website during the Black Friday period and compare it to the AOV during other key shopping periods (i.e. Valentine’s Day). Unfortunately, Calendar Events won’t help you very much. It isn’t even easy to compare conversion rates for two date ranges using Segmentation since it is difficult to create a segment on date ranges in SiteCatalyst (unlike Adobe Discover) and even if you could, there is no easy way to compare segments or compare date ranges for Success Events or Calculated Metrics in SiteCatalyst (can only be done for eVars and sProps). 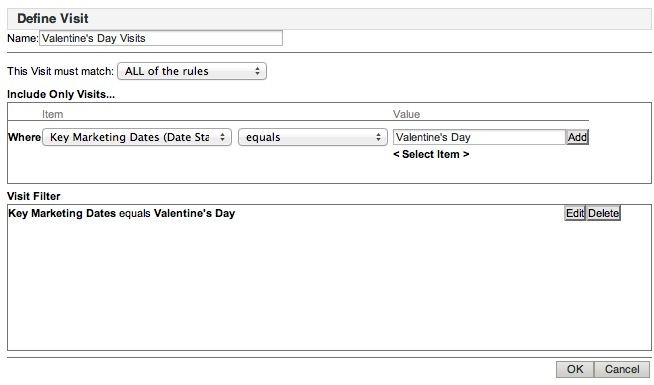 Your best bet would be to use Adobe ReportBuilder and pull a data block for the Valentine’s date range and a separate one for the Black Friday date range and compare the two. But what if you want to do this type of comparison natively within SiteCatalyst? Are you out of luck? Have no fear, Omni-Man is here to show you how to do this! Back in 2011, I wrote a blog post recommending that each SiteCatalyst implementation have a Date Stamp eVar. The purpose of this eVar was to record the date that Success Events and eVars were set and its primary use was for segmenting on dates. At the time, I was using this eVar to look for actions that took place in the past within SiteCatalyst since only Discover provided the way to segment on dates natively. As I thought about the preceding key dates issue, the idea struck me that my client could leverage this Date eVar to enable additional web analysis for key dates. To do this, you can apply SAINT Classifications to the Date eVar and denote key marketing dates for items normally found in a marketing campaign calendar. Once these items have been uploaded to SAINT, you have an eVar value that can be used to segment data by date ranges of your choosing. 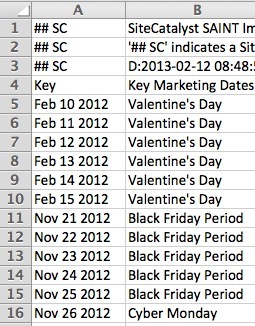 In this report, we now can see a row for each “Key Marketing Date” which is an aggregation of the specific dates associated with that key marketing date label. From here, we can add any metrics we’d like and can compare metrics for those dates. Keep in mind that these rows can contain one or multiple dates depending upon how you have classified the Date Stamp eVar. In addition to the above “ranked” report, you could switch to the trended view to see one metric trended by up to five Key Marketing Date values. It is also possible to break this report down by any other eVar report using Subrelations. For example, you might like to see the above report broken down by Products. As is often the case, no solution is perfect. If you have marketing campaigns or key dates that overlap, things get tricky. One way to address key date overlaps is to list both values in the classification value. Alternatively, you could also create more than one SAINT classification and have each SAINT column designated for a specific type of campaign. For example, the first column might be reserved for e-mail campaigns, the next column might be reserved for social media campaigns, etc. That would allow you to have multiple “Key Dates” for the same date stamp value. However, my hunch is that the above solution will work for most companies. Another potential issues is that you will only see data in the Key Marketing Date report if the date range you have selected includes the dates that were classified using SAINT. Therefore, when running these types of reports, it would be advantageous to use a longer timeframe (i.e. year). That same technique can be used for cohort analysis if you set the eVar to “Original”. The classification is what makes the difference, of course.